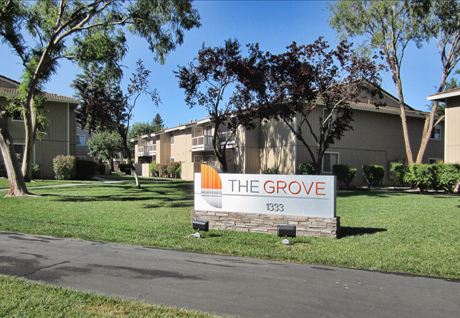 The Grove, an 80-unit rental apartment community in the NoCal college town of Davis, is more than halfway through an eight-month renovation that is designed to reposition the property and enhance its appeal to student renters. The property, which was built in 1981 and was formerly known as Brush Creek Apartments, was acquired in November 2011 by HighBridge Properties on behalf of itself and a private investor client. Located at 1333 Arlington Blvd, The Grove is less than two miles northwest of the campus of the University of California, Davis. It consists of 10 one- and two-story rental apartment buildings with a total of 36 one-bedroom units, 36 two-bedroom units and eight three-bedroom units. All of the units feature either ground-floor patios or second-story balconies. The renovation and repositioning effort began in December 2011 and is expected to be completed this coming August, in time to accommodate tenant move-ins prior to the start of UC-Davis’s fall quarter on September 24. HighBridge has directed the day-to-day activities, working with its on-site property manager, FPI Management, which oversees 60,000 apartment units in more than 10 states. Working while the property remained largely occupied, HighBridge and FPI have focused on updating the interiors of all 80 apartments. They are installing new carpeting and wood-panel flooring, repainting all rooms, resurfacing kitchen countertops, and replacing window treatments and kitchen appliances. For the first time, dishwashers will be installed and free Wi-Fi service will be available in all of the units. Improvements to the property’s exterior and building common areas are being made as well. With Davis the only California city to earn the League of American Bicyclists’ highest rating as a bicycle-friendly community, chief among them are the secured bike racks (each with a capacity of two bikes) that are being installed just outside the entrance of each apartment unit. Other changes include newly landscaped grounds, a resurfaced/restriped parking lot, new pool-side furniture for the outdoor swimming pool, a renovated community laundry room, and a new outdoor barbeque area with a gas grill.